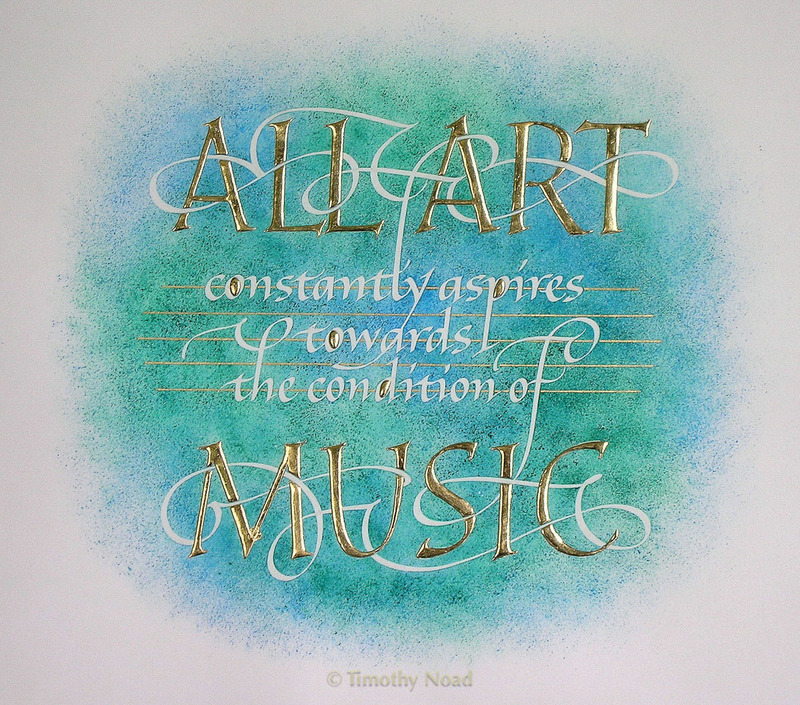 Tim is a trained and professional calligrapher and carries out a wide variety of lettering, both commissioned and personal work, traditional and contemporary in style. Examples of his work are in the Royal Collection, the Victoria and Albert Museum and the Fitzwilliam Museum, Cambridge. Retirement presentation from Brunel University. 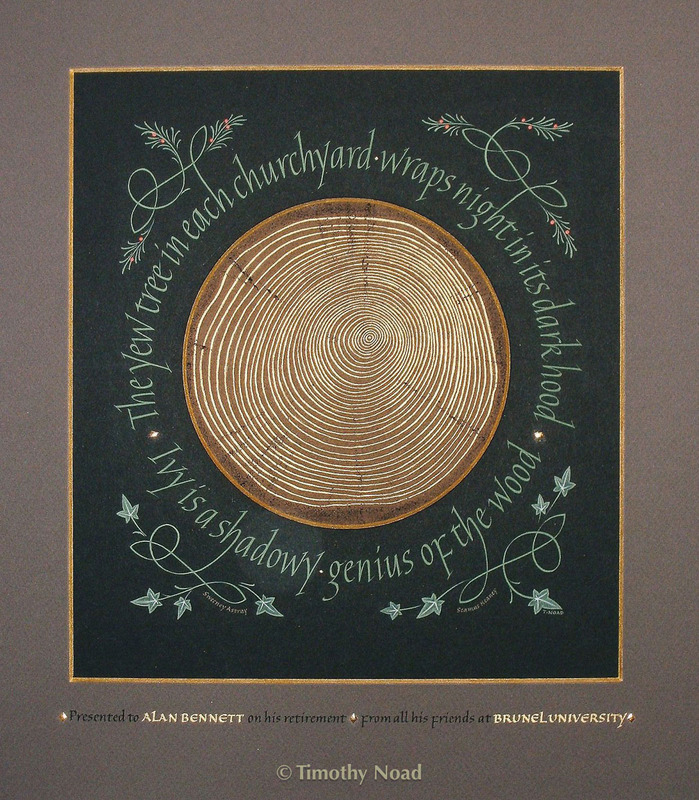 The number of yew tree rings represents the number of years served by the recipient. 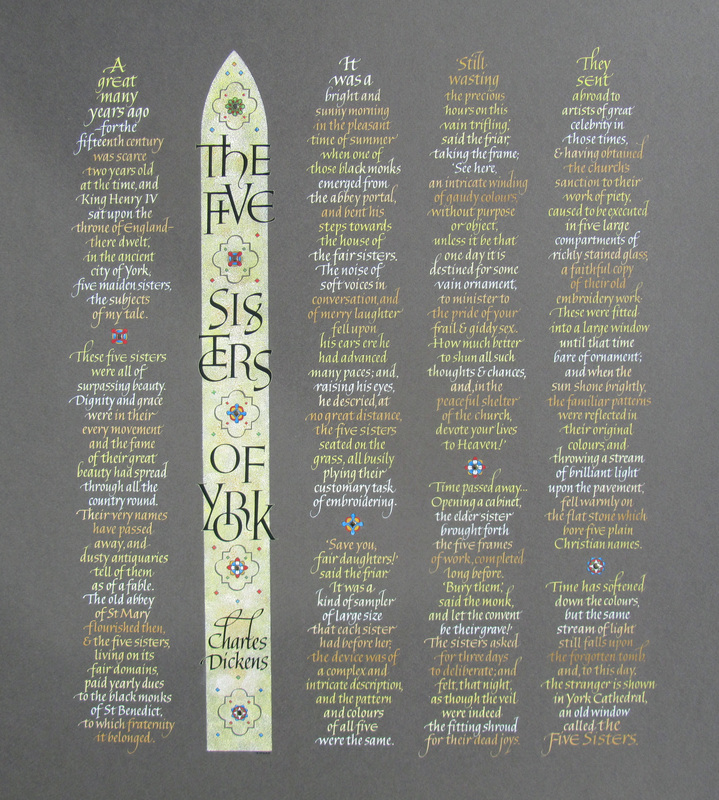 The Five Sisters of York is a legend told in Dickens's novel Nicholas Nickleby, relating the origin of a stained glass window in York Minster. Gouache and gold on grey-brown paper. Exhibited in York Minster in 2016. 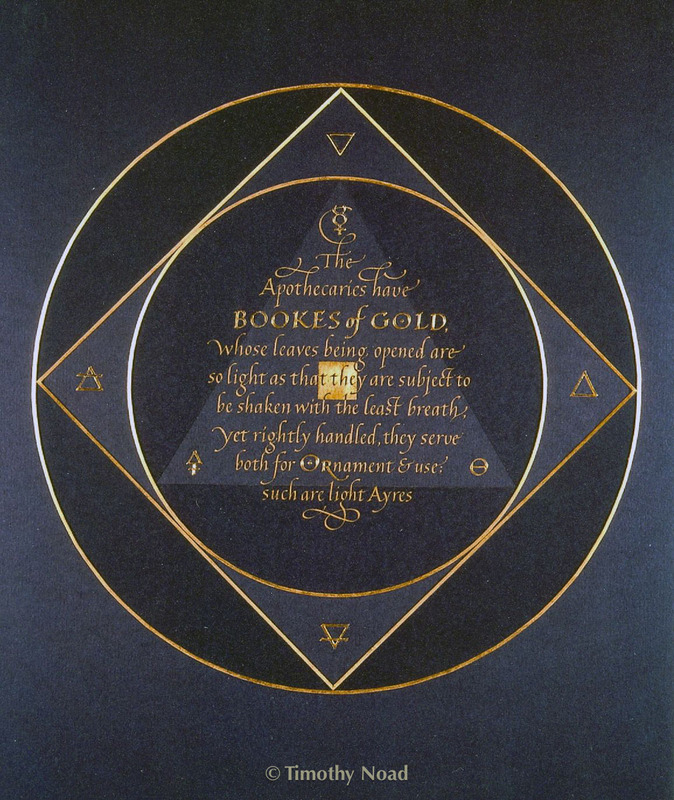 A quotation from Thomas Campion's 'Booke of Ayres', in which he compares the lightness of song to gold leaves, depicted as an alchemical diagram. 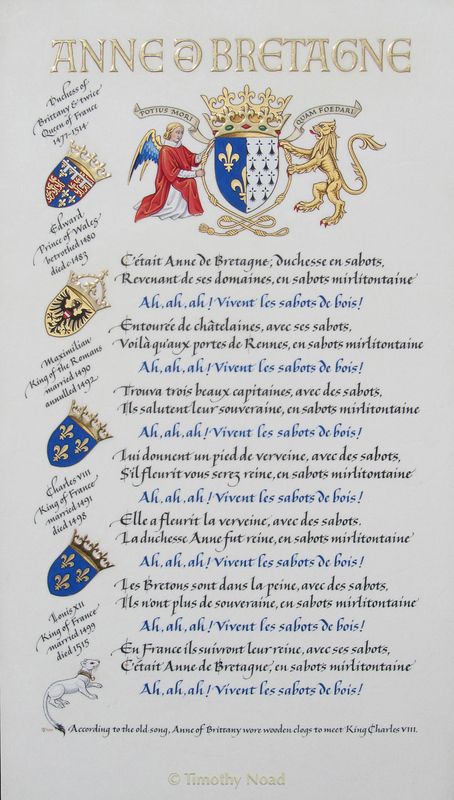 An illuminated broadsheet on the subject of Anne of Brittany, twice Queen of France, including her and her fiance/husbands' coats of arms and an old French nursery rhyme. A well-loved quotation written in Italic as a wedding present. 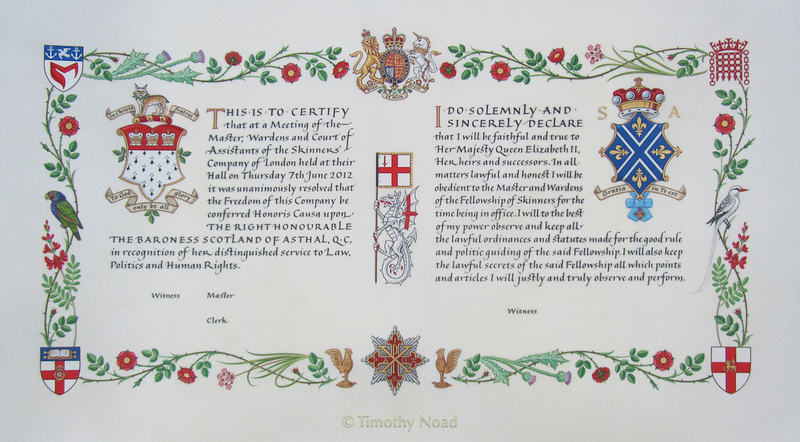 Vellum scroll creating Baroness Scotland of Asthal an Honorary Freeman of the Skinners' Company of London. The border contains plants, birds and heraldry relating to Lady Scotland's life and career. Opening from 'A Tale of Two Cities, by Charles Dickens. Gouache on paper. 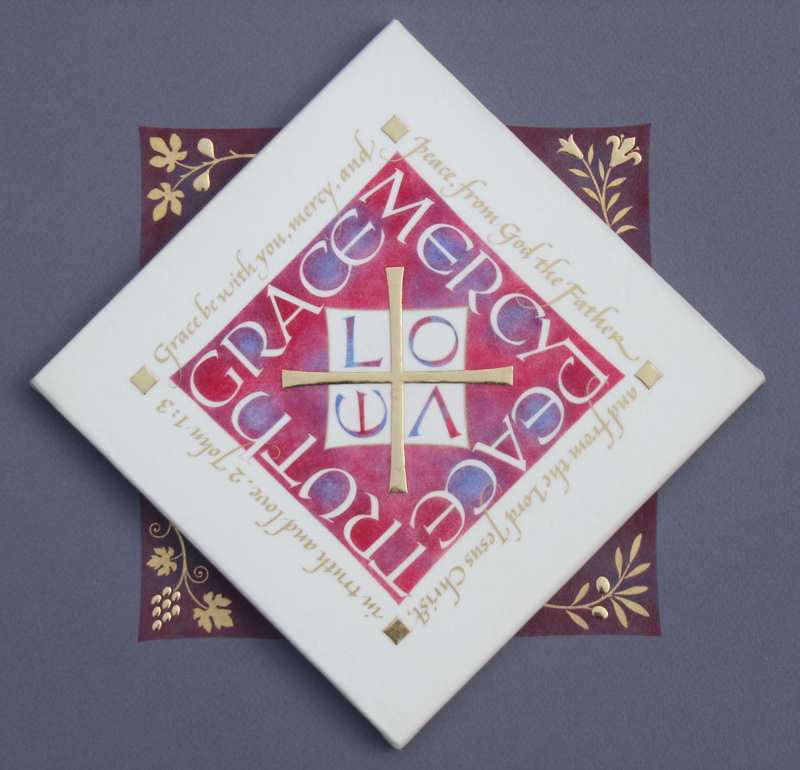 Originally planned as a demonstration piece for a calligraphic event at the Victoria and Albert Museum, the piece was subsequently commissioned and acquired by the V and A.
Salutation: the five words of greeting open the Second Epistle of St John. Gouache and gold on vellum, mounted on coloured paper with gilded plants relating to the adjacent words. Exhibited in York Minster in 2016. I AM. 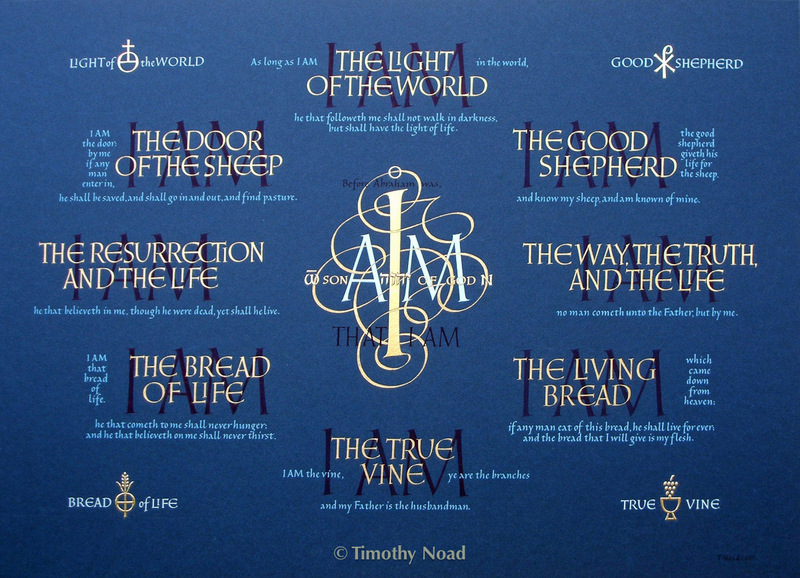 The words are those of Christ in St John's Gospel. Gouache, raised gold on gesso, gold leaf on gum ammoniac, and powdered gold, on paper. Exhibited at Lichfield Cathedral in 'Holy Writ', 2014, and in the Crafts Study Centre, Farnham in 2015. 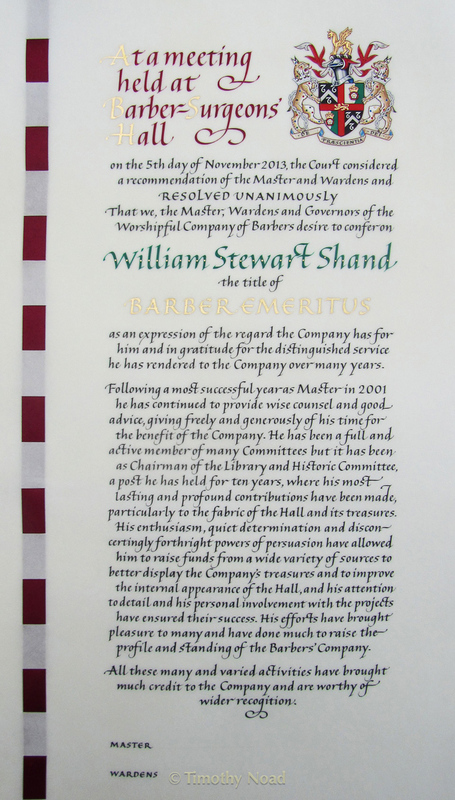 Vellum scroll creating a Barber Emeritus of the Worshipful Company of Barbers of London. 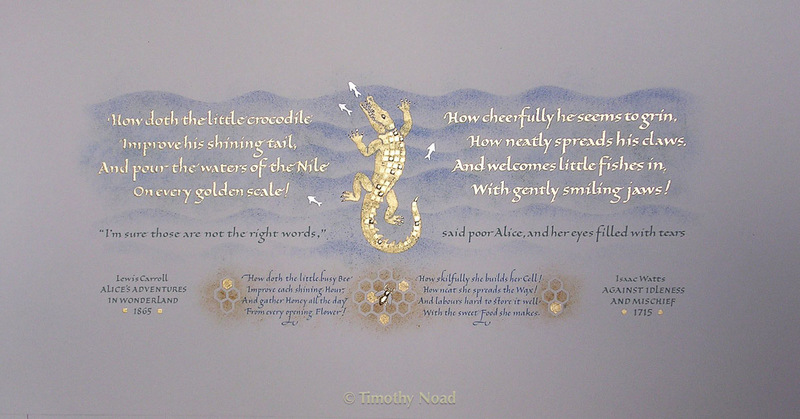 Lewis Carroll's poem 'How doth the little crocodile' written out in illuminated calligraphy, alongside the morality rhyme which it mocks, 'How doth the little busy bee' by Isaac Watts.